Those who have followed us for a while know that we adopted Dyna five years ago when she was 9 years old. JoDee, the world's most fantastic breeder of beautiful, sweet Labradors, let us have her when Dyna had retired from motherhood and our house was terribly empty after losing Tucker. Dyna is short for Dynasty and she has left quite a terrific one with scores of puppies from her line spreading far and wide. The latest one was Miss Mellow who joined an ActiveCaptain boater from Toronto last week - we hope to meet her on the Chesapeake. So while I consider myself Dyna's mom, I know she had a great one before me, her #1 Mom, JoDee. 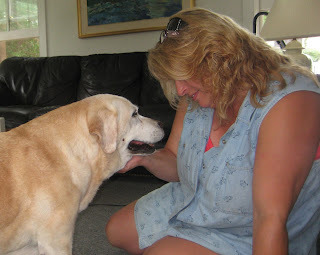 We keep in touch often and today JoDee and Al drove to Castine to see Dyna before we leave for the winter. If only I had remembered to grab the camera when they drove in. Dyna wiggled and smiled when she saw JoDee and the two of them cuddled and cooed bringing a happy tear to my eye. It was a great visit and we're hoping JoDee and Al might make it for another visit over the winter. It would certainly make Dyna happy. 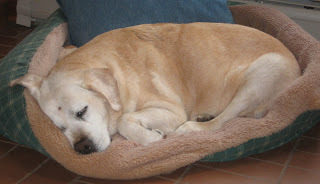 But entertaining can be exhausting and their car had barely left the driveway before Dyna had settled in for a nap.